In 2008, researchers called vitamin D deficiency a “worldwide pandemic.” In 2009, scientists found that three-quarters of Americans were coming up short on the important nutrient. In 2011, they reported that over 41 percent of participants studied were deficient in vitamin D.
These figures are concerning for all of us, because vitamin D is crucial to health. The body needs it to maintain strong bones, keep the immune system working optimally, support muscle strength, maintain healthy circulation, protect cells from damages, and much more. Those who are deficient or who have low levels are more at risk for cardiovascular disease, Alzheimer’s disease, hip fractures, pregnancy complications, depression, and even cancer. You may not realize that vitamin D is crucial for your skin and hair, too. It’s involved in skin development and repair, and helps prevent premature aging. Without it, your skin may appear dry, dull, and lifeless, and you may be more vulnerable to inflammation, redness, and acne. The best way to get vitamin D is through sun exposure, but repeated sun exposure can also damage your skin. How can you get around this no-win situation? The skin regularly renews itself through a process of sloughing off old, dead skin cells on the surface and allowing newer, younger cells to emerge from underneath. Vitamin D is important to this process, as it helps trigger growth factors and other molecules responsible for cell division and differentiation. The more active the regeneration is, the more alive your skin looks, as it continues to rebuild at an optimal rate. If there isn’t enough vitamin D, the skin can suffer, potentially becoming fragile and thin. Vitamin D is also important to the skin’s ability to hang onto moisture. If you’re low on vitamin D, your skin and hair may appear drier, and you may notice more fine lines and wrinkles. The nutrient works with the immune system to protect skin from daily microorganisms, and to neutralize damaging free radicals that lead to premature aging. Vitamin D is even involved in the wound-healing process, inducing gene expression changes that help eliminate any bacterial or other infectious invaders. Meanwhile, we are learning more about what vitamin D can do for the skin every day. Already, it’s been applied topically to treat certain skin conditions, like eczema and psoriasis. Our main source of vitamin D is the sun. Though vitamin D is present in some foods, it’s not enough to meet our daily requirements. Ultraviolet B (UVB) rays stimulate the production of vitamin D3 by reacting with a cholesterol substance in the skin. (UVA rays are not involved in vitamin D production.) When the sun hits your skin, it awakens this cholesterol substance (called 7-dehydrocholesterol or 7-DHC) and the two together then form vitamin D3. From there, the body takes over, transporting the vitamin through the bloodstream to the liver, where it’s transformed, and again to the kidneys, where it’s transformed again to be used as the body needs it. The first three factors are all about “intensity” of the sunlight. In the winter, the sun is farther away from the earth, so the UV rays are less potent. The same thing happens in the northern latitudes. 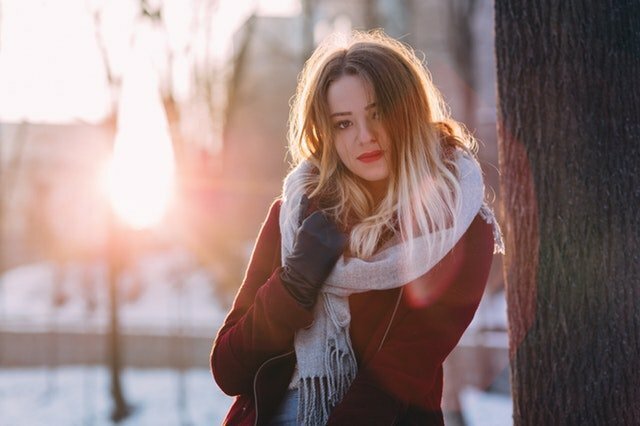 In fact, scientists say that people who live in the northern half of the United States are more at risk for vitamin deficiency, particularly in the winter months. The sun’s intensity varies by the time of day, as well, becoming most powerful between the hours of 10:00 a.m. and 3:00 p.m., with midday radiation being the most intense. The last four factors are more personal. Those with darker skin types have more melanin in the skin, which actually competes with the 7-DHC for the absorption of UV rays. People with darker skins require more time in the sun to synthesize enough vitamin D.
As we age, we become less efficient at synthesizing vitamin D because we have less 7-DHC in our skin compared to younger people. And of course the more skin exposed, the more vitamin D we can make. Finally, using sunscreen that blocks UVB absorption also prevents vitamin D synthesis. One study found that applying an SPF 8 sunscreen could reduce production of vitamin D in the skin by more than 95 percent. You need the sun to make vitamin D, but too much sun causes too much damage to your skin (and hair). What can you do? The sun is a double-edged sword for us. Yes, it helps us create vitamin D, but it can also burn the skin and cause cell damage that can lead to aging and sometimes, to cancer. That’s why we’re constantly advised to use sunscreen regularly and liberally. Yet that very advice can cause our vitamin D levels to plummet. Harvard Health states that American researchers have reported low levels even in healthy young adults. That means we have to find ways to get more vitamin D. If you’re a healthy Caucasian living in the southern latitudes or even the northern ones during the spring and summer, you can likely get a good dose by spending 10-15 minutes outside around midday with your arms and hands and potentially your legs or back exposed. The short time is unlikely to cause damage leading to cancer, and as long as you keep your face covered (hats, umbrellas), you won’t risk premature aging. African Americans and others with dark skins won’t get enough that way, though, and Caucasians will have a hard time getting enough in the winter months, or if they live in the northern latitudes. That’s why most doctors now recommend a quality vitamin D3 supplement for most everyone. SourcesMichael F Holick and Tai C Chen, “Vitamin D deficiency: a worldwide problem with health consequences,” Am J Clin Nutr, April 2008; 87(4):1080S-1086S, http://ajcn.nutrition.org/content/87/4/1080S.full.Adit A. Ginde, et al., “Demographic Differences and Trends of Vitamin D Insufficiency in the U.S. Population, 1988-2004,” Arch Inter Med. 2009; 169(6):626-632, http://archinte.jamanetwork.com/article.aspx?articleid=414878.Jordan Lite, “Vitamin D deficiency soars in the U.S., study says,” Scientific American, March 23, 2009, http://www.scientificamerican.com/article/vitamin-d-deficiency-united-states/.Forrest Ky, Stuhldreher WL, “Prevalence and correlates of vitamin D deficiency in U.S. adults,” Nutr Res., January 2011; 31(1):48-54, http://www.ncbi.nlm.nih.gov/pubmed/21310306.“Optimal Skin Protection with Vitamin D,” Life Extension, June 2010, http://www.lifeextension.com/magazine/2010/6/optimal-skin-protection-with-vitamin-d/page-01.“Vitamin D and Skin Health,” Linus Pauling Institute, http://lpi.oregonstate.edu/mic/health-disease/skin-health/vitamin-D.Matsuoka LY, Ide L, Wortsman J, MacLaughlin JA, Holick MF. Sunscreens suppress cutaneous vitamin D3 synthesis. J Clin Endocrinol Metab. 1987;64(6):1165-1168, https://www.ncbi.nlm.nih.gov/pubmed/3033008. “Vitamin D and your health: Breaking old rules, raising new hopes,” Harvard Health, February 2007, https://www.health.harvard.edu/newsletter_article/vitamin-d-and-your-health-breaking-old-rules-raising-new-hopes.“Make Vitamin D, not UV, a Priority,” Skin Cancer Foundation, https://www.skincancer.org/healthy-lifestyle/vitamin-d/make-vitamin-d-not-uv-a-priority.